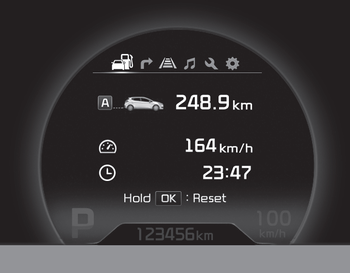 This mode indicates 3 kinds of driving Information. All stored driving information (except odometer, distance to empty and instant fuel economy) resets if the battery is disconnected. The meter's working range is from 0.0 to 9999.9 km (0.0 to 9999.9 miles). Pressing the button for more than 1 second, clears the tripmeter to zero (0.0). Even if the vehicle is not in motion, the average speed keeps going while the engine is running. Pressing the button for more than 1 second, when the average speed is displayed, clears the average speed to zero (---). Pressing the button for more than 1 second, when the driving time is being displayed, clears the driving time to zero (0:00).